The next crops will open for registration soon, so make plans to come Scrap the Map in Florida, Georgia, Mississippi, Texas, California, Alaska, or Colorado! Watch for the schedule to be posted soon. If you’re new to digital scrapbooking, come learn what the buzz is all about, check out amazing scrapbooks, and meet the pros. If you already love digiscrapping and online crops, come scrap with your friends in real life. Scrap the Map is led by Margie Lundy as she travels the country and actually scraps the entire map, bringing DSP to you. Meet the designers, instructors, staff, and members of the DSP community and experience the joy of gathering with others who share your passion. Watch for a laptop crop near you. 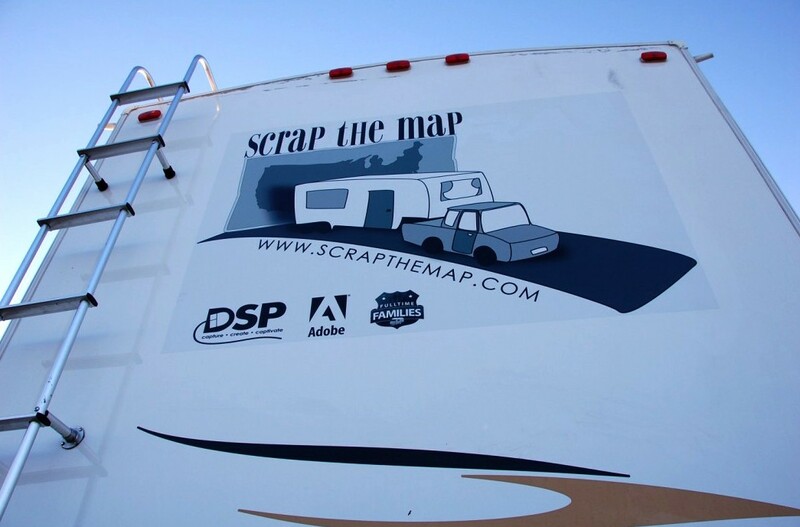 You might spot the DSP RV in your hometown soon! Digital Scrapbook Place, Inc. offers high quality products, community, support, and education at the largest digital scrapbooking site on the Internet: www.digitalscrapbookplace.com. DSP products are also in scrapbook and photo stores around the globe. Besides extremely creative, the DSP staff is also helpful, friendly, and fun! DSP is dedicated to helping you use digital technologies to capture your memories, create scrapbook pages, and captivate your loved ones for generations. Come and be inspired!